published by the Dorset Publishing Company (ISBN 0-948699-75-2). We are most grateful for the publishers' kind permission to reproduce this material. This fascinating book, which records in chronological order wartime events in Dorset during the war, may be obtained from local book shops or from Halsgrove Direct (Tel: 01884 243 242). "Hard pressed 213 Squadron, flying Hurricanes from R.A.F. Exeter, has lost another pilot off the Dorset coast. Contact ceased with P3348, being flown by 22-year-old Sergeant Pilot Philip Purchall Norris, over the sea near Portland, at 15.42 hours. He was shot down during combat and is presumed to have been killed. The Hurricanes of 238 Squadron from Middle Wallop also took part in the dog fights. One of the flyers, 22-year-old Sergeant Pilot Ronald Little, was driven away unhurt after P3805 had crash-landed at Bredy Farm, a mile east of Burton Bradstock." Sunday, 25th August 1940 - "Another Hurricane crash lands at Burton Bradstock"
"Hurricanes of 87 Squadron and 213 Squadron from RAF Exeter joined in today's dogfights over Portland. Sergeant Pilot Sidney Richard Ernest Wakeling of 87 Squadron was killed at 17.25 hours when his fighter, V7250, plunged in flames at New Barn, on the hillside south of Bradford Peverell, north-west of Dorchester. He was aged 21. Then, 213 Squadron lost two fighters at about 17:30 hours - to Messerschmitt Bf.109's - into Lyme Bay. The missing flyers are Pilot Officer Harold Derrick Atkinson, in P3200, and Pilot Officer Jaques Arthur Laurent Philippart. Atkinson, a Yorkshireman, celebrated his 22nd birthday on Monday. Philippart, aged 31, escaped in May from the invading Germans, by air and sea, and became the first Belgian ace of the war. He was shot down off Portland by Hauptmann Mayer of I Gruppe, Jagdgeschwader 53. A third fighter, N2646, crash-landed at Burton Bradstock but is repairable. The flyer, Sergeant Pilot Ernest Snowdon, is unhurt." 'Scam' projects tested in Dorset. Boffins are trying out their Scam Projects on the Dorset coast. A floating airfield, codenamed Lily, has been tested in Studland Bay by a Royal Navy Swordfish biplane carrying a bomb load and using rockets to enable an exceedingly short take-off. 'Scam' is the fun side of the secret war, experimenting publicly with projects of deception, this can be seen as applicable in seaborne attacks against the strongly fortified coast of north-eastern France - rather than the soft sands of Normandy. For the army there is a floating pier, the Swiss Roll, which has carried heavily loaded Bedford lorries across choppy waters in Weymouth Harbour. 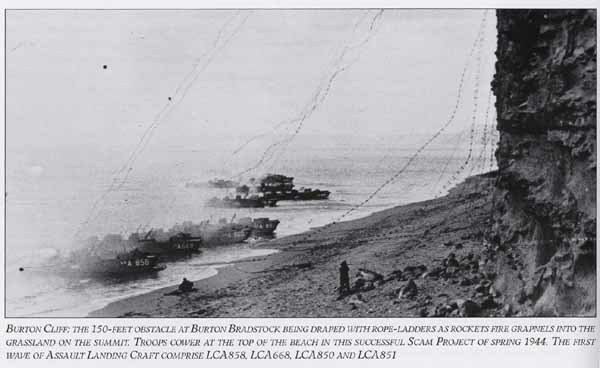 More practical are the rockets being used to fire grapnels attached to rope ladders for commandos to scale the 150-feet cliffs between Bridport and Burton Bradstock." Monday, 17th April 1944 - "80,000 American soldiers have moved into Dorset"
With the movement of the war into and across Europe throughout the second half of this year there have been inevitable consequences on this side of the Channel. One of them is that from today the Home Guard is stood down." A Martinet from the Armament Practice Camp at Warmwell Aerodrome today developed engine problems over the Chesil Beach Bombing Range. The pilot crash-landed at Burton Mere, on the coast between Swyre and Burton Bradstock, but found himself trapped in the wreckage. Two heroes ignored the flames which were about to engulf the aircraft and succeeded in freeing the pilot's feet. They were Miss Harriet Evelyn Bendy, aged 68, and Levi Rogers, aged 65. Both live in Burton Bradstock. As they pulled the shocked airman to safety his aeroplane became an inferno." New Year's Eve has seen the last rites for the Home Guard which has been finally and formally disbanded by the War Office. Its last County Commander, General Henry Jackson, paid a glowing tribute to his men: 'The spirit of comradeship and service which was brought to life by service to the Dorset Home Guard must never be allowed to die.'"